These Pet Rescue level 389 cheats and tips will help you beat level 389 of Pet Rescue. 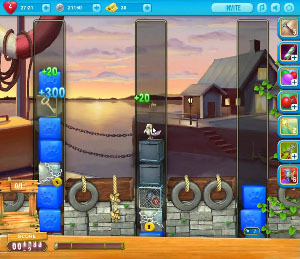 The objective of Pet Rescue level 389 is to save 1 pet and get 5,000 points. Pet Rescue Saga level 389 looks tricky, but it’s actually not. You’ll need to use the line blasts to clear away the majority of the metal blocks and cages. Remember to think ahead for each move so you can plan where your line blast will fall. There is only one color in this level. That’s awesome because you can use the balloon to decimate the board. Pop the balloon to drop your pet and elements to the bottom of the board. There is a good chance you get your pet stuck in a cage towards the bottom of the level. No matter, you have several line blasts at the bottom, that when shot off in the correct order, will free and drop your pet. Of course, this all depends on what you have left at the bottom.